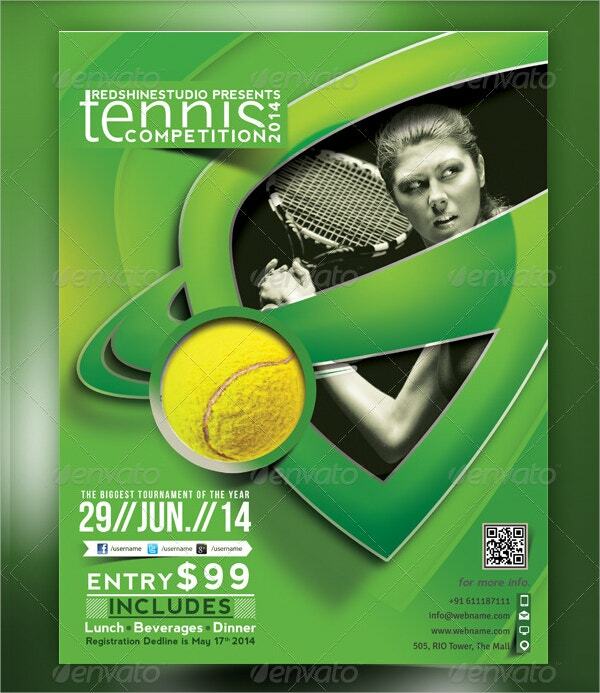 Tennis tournaments and championships are organised at regular intervals all around the world. 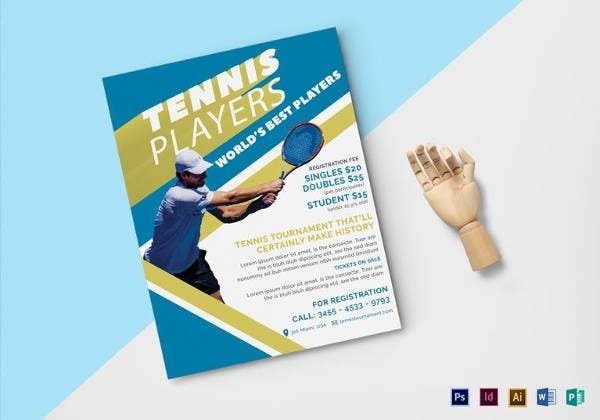 To advertise these tournaments and to capture the attention of budding tennis players, you should make use of flyer templates and posters. 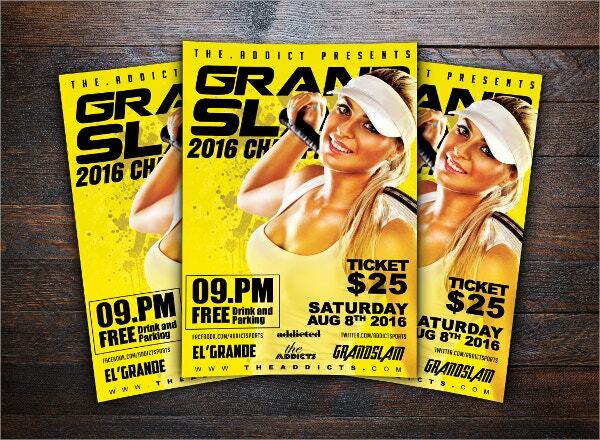 As displayed in these flyer templates, close attention must be paid to the overall appearance of the flyers. 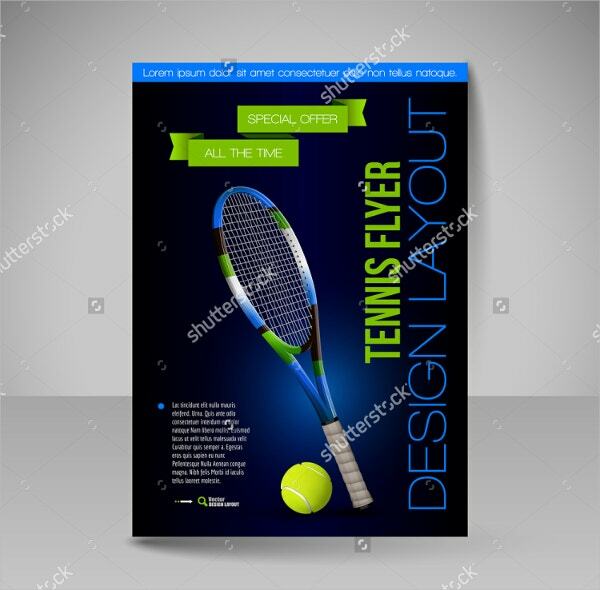 The combination of relevant text with bright and colourful designs, as seen in all of these templates, makes for amazing tennis flyers or posters. You can also see Racing Flyers. 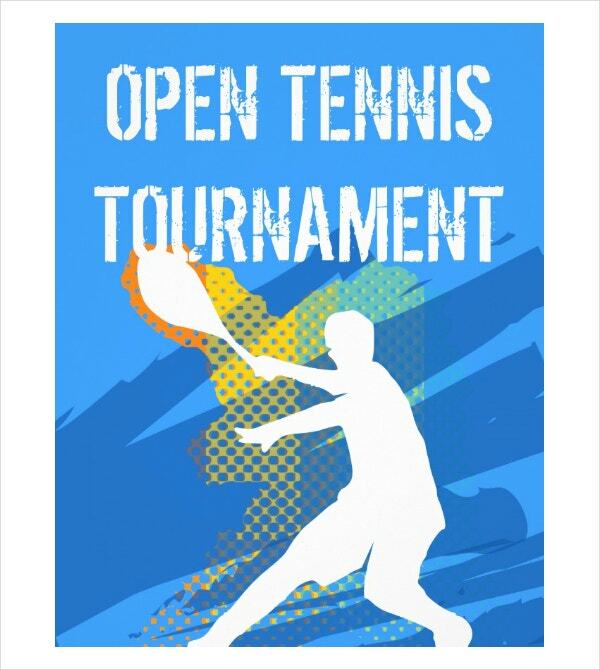 For a competitive tournament in tennis, this would be a great poster template. 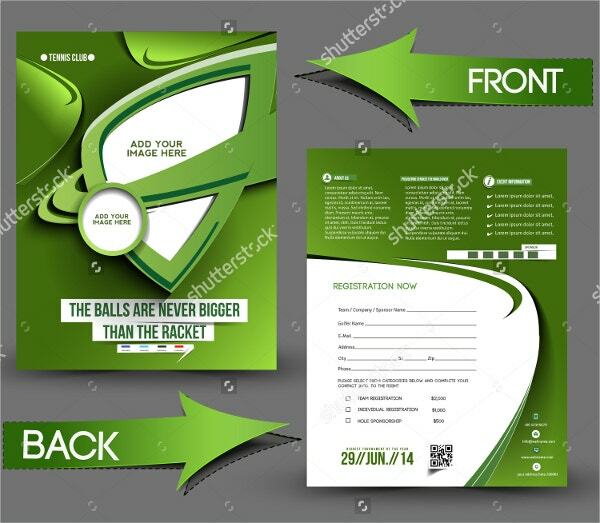 The grit and mettle displayed in this easy to use and customize template make this a popular choice. 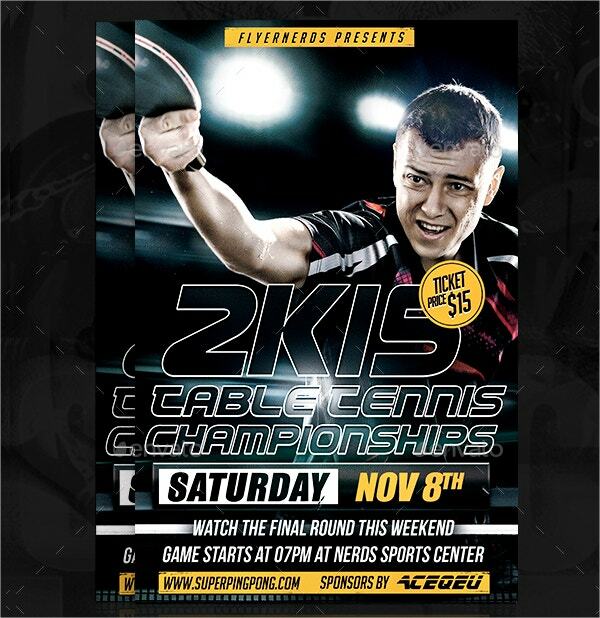 If you are looking for a tennis themed flyer, then this is the one for you. 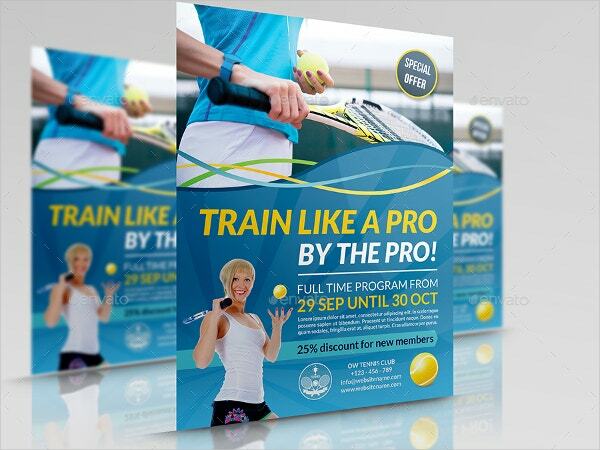 This template comes with editable text, CMYK colour mode, 300 dpi resolution and also the option to replace the photos in the flyer. The striking combination of royal blue and green immediately brings to mind a thrilling game of tennis. 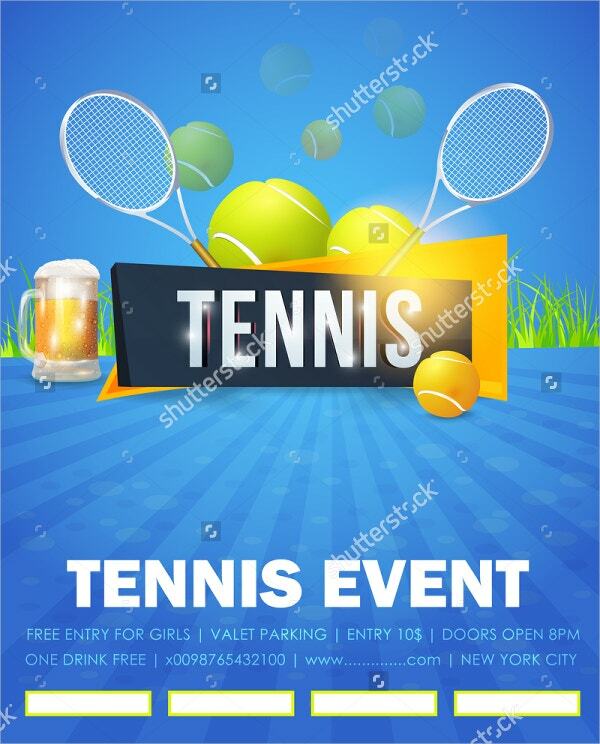 Complete with all the conventional symbols of tennis, this template would be great for a sports flyer. 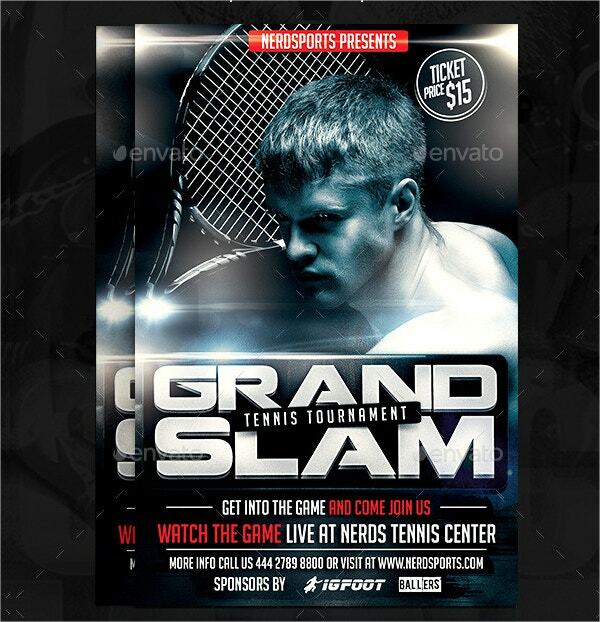 This flyer template would be perfect for any tennis competition. The images that you see in the preview aren’t included as part of the package. Instead, you would be getting the option to replace the images with your own. 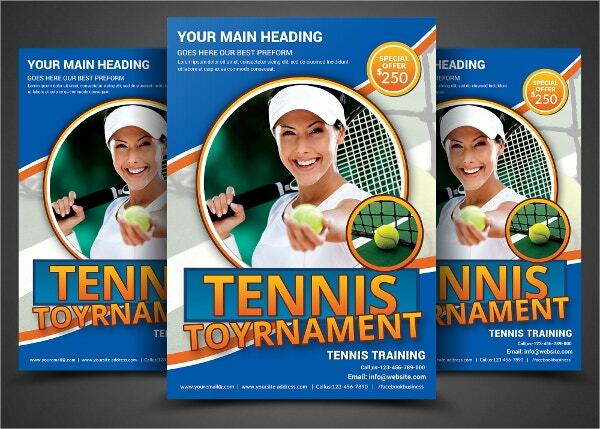 This modern tennis flyer template comes in layered psd files. The template uses a colour scheme of CMYK and a high resolution of 300 dpi. Also, it is ready for print and is completely editable. You can also see Social Media Flyers. In this template, you get to make the most of both sides of the flyer. 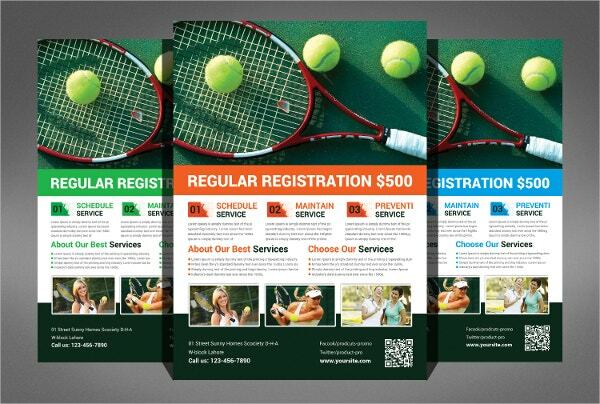 You can incorporate the important details about your tennis competition on the front, and reserve the extra information for the other side. This template comes in layered files and is100% editable and customizable. The model image that you see in the template is included as part of the help file that comes along with the template. 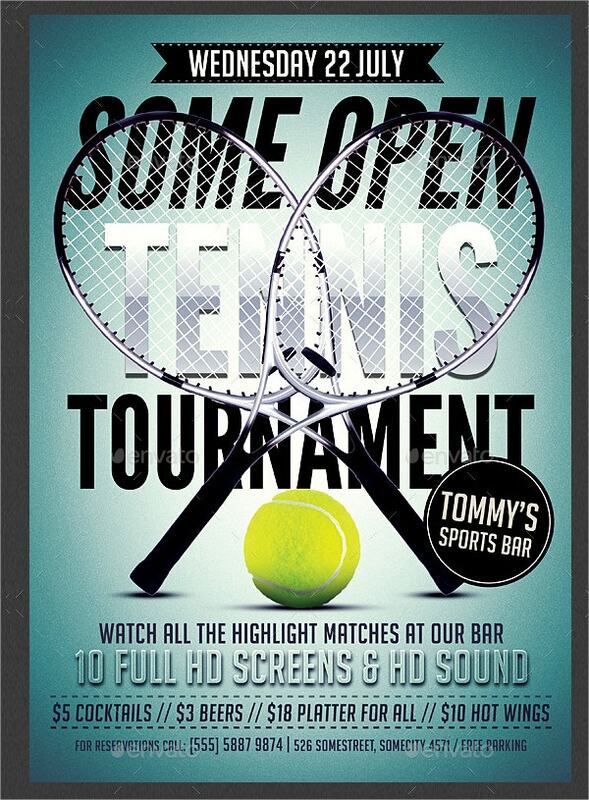 The bright yellow flyer would be perfect if you’re trying to advertise a tennis championship. The template comes in a standard size and is ready for print. It also comes in layered and organized files. This template is pretty versatile since it can be used as both a flyer and a poster. Also, it comes in a number of sizes so that you can download the one that suits your purpose. For table tennis players, this template would be perfect! 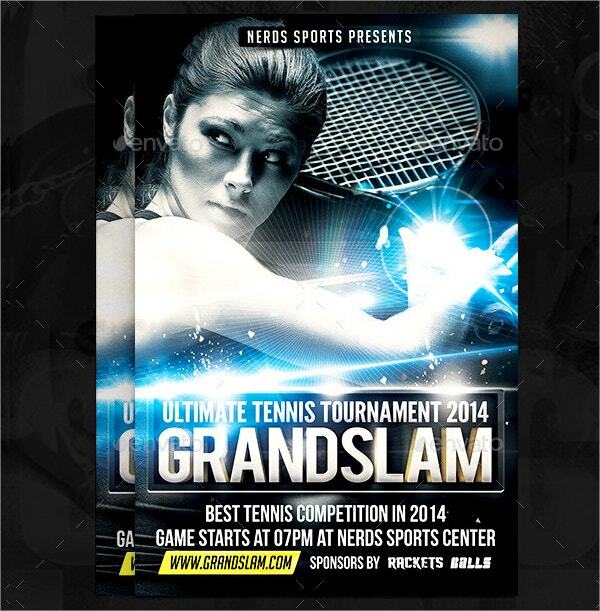 The look of the table tennis flyer makes it all the more attractive. It is ready for print; you’ll just have to download the template and tweak the details. 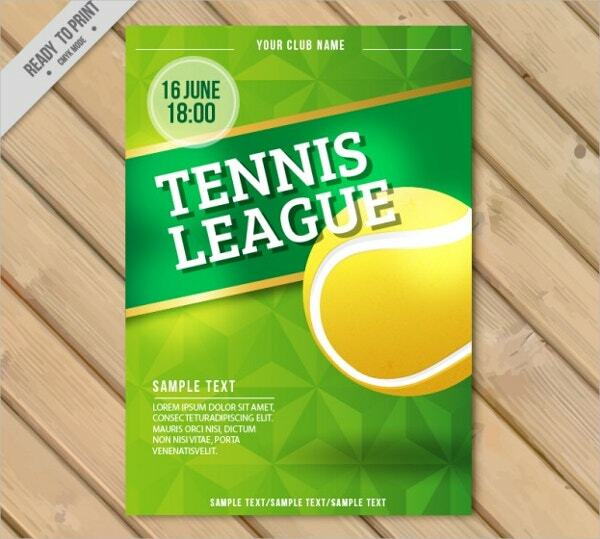 In this case, you will be getting a free vector for your tennis league flyer or poster. This template bears a very professional look and presents all the relevant details about the league in a clear, logical manner. You can also see School Flyers. This template has to be one of the most supreme examples of flyers. It comes with catchy headlines and vibrant images, all of which are editable. You would be able to personalise the template with ease. The simple design of the template, coupled with the full page design make it an attractive one. 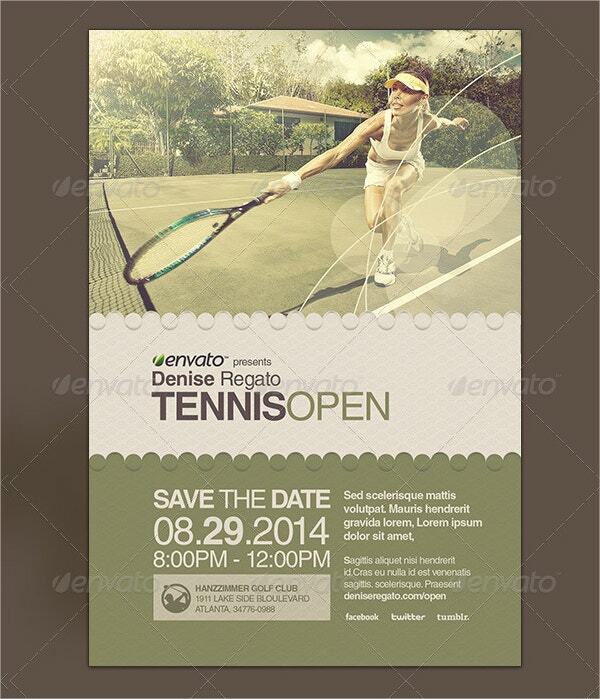 You’ll be able to customize both sides of the flyer template; also you get different sizes to choose from. The colour scheme on the template is subject to change. Once you download the template, you’ll be able to alter it and make changes to the textual components as well. 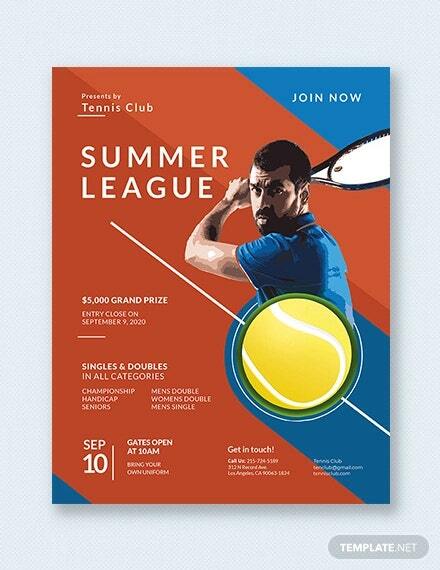 This flyer template has a modernized design that immediately catches your eye. You would be getting three layered psd files here. The template comes with guidelines and is ready for printing. One of the major perks of these templates is that they are all editable. 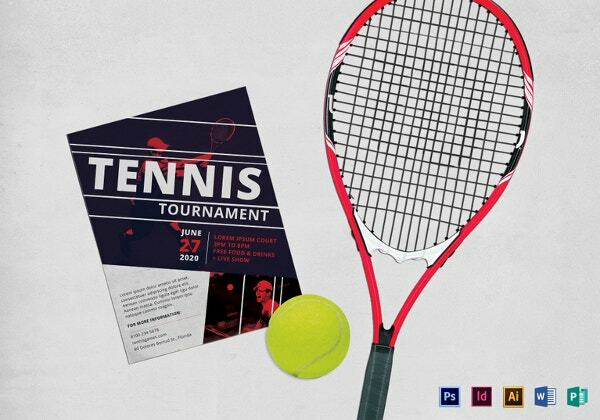 You would not only be able to alter the information on the tournament or club flyers, but also change the colour schemes and the fonts and even add your own images. That makes these templates easy to approach and use. You can also see Political Flyers.